Thousands of eSports racers competed for 100 spots after a grueling 36-day qualification period, hopeful to catch the eye of a NASCAR race team. The top 100 players from the eNASCAR Heat Pro League qualifications will move on to the Showcase races — special races designated for drivers to impress real NASCAR teams looking to select their drivers — ultimately leading up to a live draft in March. Racers put it all on the line. Beyond the Showcase races, NASCAR teams participating in the eNASCAR Heat Pro League will use driver performance data, results and observations from Showcase races, and their own independent research to identify which gamers to draft to represent their teams. Just wanted to drop a note to all that have competed. Whatever class you ended up in night over night. You all made these last 36 days very special. I hope whatever happens that you will support the league and your fellow drivers as they go forward. The latest episode of eNASCAR Heat Pro League’s web video series showcased some of the top competitors and expectations for their paths to a ride in the series. 704 Games staff recently met with NASCAR teams to explain the draft process and what to look for in their drivers. 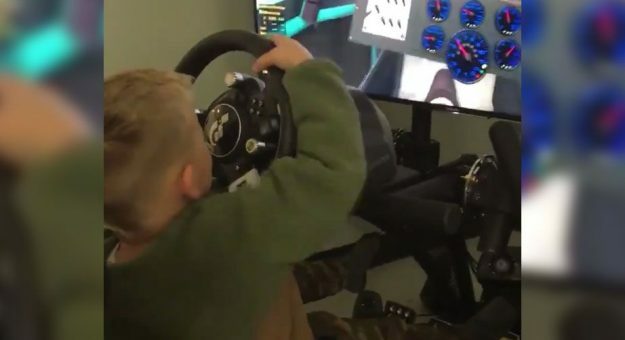 At four years old, it’s a little tough for Cash Bowyer to reach the pedals on a race car (or a virtual car) — but that’s OK. Clint Bowyer’s classic ingenuity to the rescue! It probably won’t be long until Cash is turning laps with Dad’s teammates Chase Briscoe and Cole Custer. On the PC gaming side, iRacing announced new plans ahead of the eNASCAR PEAK Antifreeze iRacing Series — official NASCAR teams and high-profile eSports teams will join the series in 2019. Among the new teams are JR Motorsports, Joe Gibbs Racing, Wood Brothers Racing, and Clint Bowyer Racing, along with eSports outfits Williams Esports, Richmond Raceway Esports, G2 Esports, FlipSid3 Tactics, and Team Renegades. New to the series, a live draft of eligible drivers will take place on January 30. The 2019 season — the 10th of the series — also features an expanded prize pool of $100,000 and the appointment of NASCAR’s Jusan Hamilton as Series Director. With Jimmie Johnson’s new paint scheme unveiled this week, iRacing painter Dustin Winegardner wasted no time creating the virtual version of the No. 48’s new colors. Jordan Ashelin created a throwback design of Joe Nemechek’s car from the late ‘90s, which looks sharp on a modern-day Camaro ZL1. It doesn’t get much closer than this. While there was certainly some luck involved in threading the needle, we’ve got to give some credit to the driver to make it through unscathed. Marcos Ambrose — yes, that Marcos Ambrose — has started offering iRacing driving advice in a new video series. It’s impressive to listen to the two-time Monster Energy NASCAR Cup Series race winner explain in great technical depth how the car behaves at an oval, and just how much that information translates to iRacing.